Each month, Platinum Recruitment randomly selects one of our top hospitality recruiters to choose a charity. All of our internal staff have the option to donate £1 per week of their salary to charity. We then not only match our team’s donation, we double it! This month we are proud to announce our lucky winner is Sophie MacKenzie. Sophie is a dedicated team member from our Elite Chef Division. She made a great suggestion by nominating the Margaret Green Animal Rescue as her chosen charity. 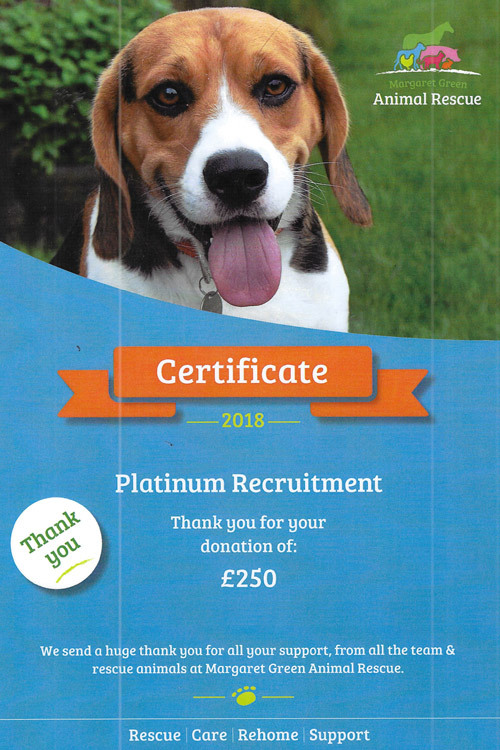 Platinum Recruitment donated a total of £250. Margaret Green Animal Rescue takes in homeless pets that have been abandoned or mistreated. They specialise in rehoming the pets in their care, including dogs, cats, horses, rabbits and more. Originally founded by Margaret Green in 1965, the animal charity now has three rescue and rehoming centres across Devon and Dorset and take care of over 1,200 animals each year. The local charity hosts a range of events throughout the year for all the family. Their next event is the Dog, Sausage & Cider festival at the Springhead Pub in Sutton Poyntz on the 26th of August. The festival line-up includes live music, shopping stalls and a dog show. It even features the mighty Sausage Throwing contest (if you are into that sort of thing). If you would like to find out more about this wonderful charity, please visit margaretgreenanimalrescue.org.uk or check out their Facebook or Instagram pages. There are many ways you can show your support, including fundraising, volunteering or sponsoring an animal. If you would like to make a donation, please click here. Just TWO weeks away from our Family Fun Day & Novelty Dog Show on the 5th August at our Church Knowle Centre in Dorset.